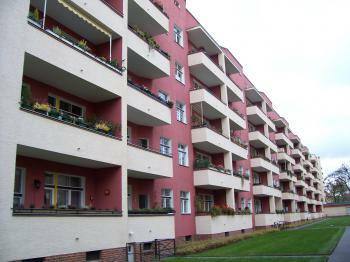 The "Berlin Modernism Housing Estates" represent low income housing architecture from the early 20th century. Bruno Taut, Martin Wagner and Walter Gropius were among the leading architects of these projects which exercised considerable influence on the development of housing around the world. My drive back from Poland, where I had visited Wroclaw and the Churches of Peace, brought me on the Berlin Ring Road. I knew that one of the Housing Estates is located close to the Schönefeld Airport, so I looked up its exact location and decided to just stop by. 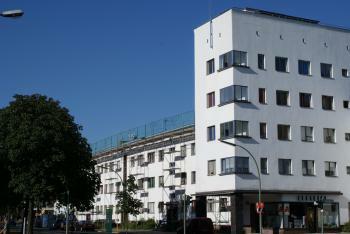 This site is the Gartenstadt Falkenberg, the earliest of the modernist estates (1913). 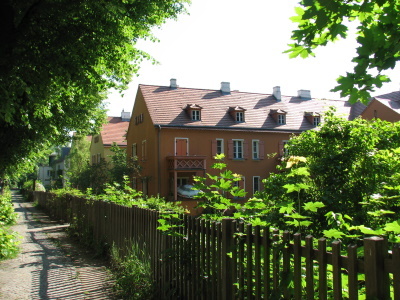 It is nicknamed Tuschkastensiedlung ("Paintbox Estate"). Like the reviewers below have stated about other parts of this serial nomination, this also is ‘just’ a residential area with ordinary people going about their daily business. The main street is the Gartenstadtweg. Here several types of housing can be seen, all in full colour: apartment blocks, free standing villas and rows of town houses. All have their own gardens to grow vegetables and flowers. The streets are lined with trees. I'm not sure which of the houses in this street are original, but there are 93 of them according to the nomination dossier. A sign at the side of the road advertised ‘Do you want to live in a Unesco World Heritage Site? 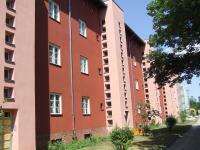 Now for rent: apartments in the 2003 extension of the Gartenstadt. Only 639 EUR per month!’ Obviously not the real thing, but the area in general has a very peaceful feel to it due to the abundance of greenery. I wouldn’t mind living there… (maybe ought to look up the local crime rate first). This is a slightly odd WHS - a bunch of apartment buildings, you ask? But they are actually surprisingly interesting. I quite enjoy sites that are still living parts of a city. I visited three of the six apartment blocks, using a rental cycle to get between them and then back to my accommodation in the centre of Berlin. First I went to Wohnstadt Carl Legien, then Weiße Stadt and then Siedlung Schillerpark. There weren't many people around and nobody seemed to mind that I was wandering through the grounds and taking photos - I guess they're used to it. I have since learned that there are actually some tours you can do which will take you inside some of the apartments - I wish I had done one of them because I think it's hard to completely understand the significance until you've seen how people live in the blocks. On a sunny summer Saturday, I made full use of a public transport day ticket and visited 3 of the 6 inscribed parts of this site. I first went ot Gartenstadt Falkenberg (near the Grünau S-Bahn stop), then to Britz (near the Parchimer Allee underground stop), and then to Siemensstadt (stretching between the Halemweg and Siemensdamm underground stops). All 3 were easily accessible by underground or S-Bahn, and although I'm not a big fan of modern architecture in general, it was quite pleasant to criss-cross the city and see Berlin from a different perspective. Each estate seemed to provide a high quality of living - I enjoyed Falkenstadt for its park-like setting and multi-coloured houses, and Binz for its unique horseshoe shape and pretty pond in the centre of the horseshoe. To me, Siemensstadt was the least attractive of these 3, as it features row after row of multi-storeyed houses where only the balconies are somewhat unique. I visited this WHS in May and June 2014. Once I landed in Schönefeld airport, I drove for about 10-15mins to Gartenweg to visit Tuschkastensiedlung Falkenberg. There is an information board in English and German to illustrate which houses are inscribed in which year they were built. It's a pleasant stroll in a tree-lined and cobblestoned street with colourful painted houses, most of which having well kept gardens. I took a couple of photos of the most striking houses and facades but I didn't feel comfortable taking photos of people's private property (especially since there were quite a few elderly women killing time near their windows!). A few days later I drove to the Hufeisensiedlung Britz which I found to be less interesting on the whole since its horseshoe shape is not that evident from the pavement. I also spotted it for a few seconds just after take off from Berlin and then it was easy to recognise from its shape. I'm glad I visited this WHS as there aren't too many modernism sites on the list. However, I wouldn't describe this WHS as one of Germany's best WHS and on the whole I wouldn't describe it as having outstanding universal value. As other reviews have shown, it is possible, if you wish, to see all 6 sites in a day using the U-Bahn. For those with less interest or stamina our experience of taking in just 3 with a car might be of use. Our general plan was to pass by Berlin to the west and, whilst so doing, we were able to take in Siemensstadt, Schillerpark and Weiße Stadt in around 2 hours elapsed with what we felt was “reasonable” viewing/ “walking around” time. We started around 5.30pm and didn’t find parking or traffic a problem. We approached from the South on the A100 and the turn to Siemensstadt is well signed where the Stadtring it is joined by the A111. The road leads to the centre of Siemensstadt via Siemensdamm – turn right at the U-Bahn station along Jungfernheideweg and you are in the Siedlung. We parked without payment or limitation on the right in Goebelstr. The WHS aspects of Siemensstadt are well signed with an information board (in German) in front of each block. At the end of Goebelstr, where it reaches Goebelplatz, is an information centre/café - but it was closed when we were there. The variety of the estate buildings demonstrates well the fact that 6 different architects were each given freedom to develop their own style – my architectural knowledge wouldn’t have been enough to identify whose “block” was whose so it was good to have the explanations! Next we went to Schiller Park. The first part of this is very easy – just return along Siemensdamm and follow the signs to Wedding along the A100 - a distance of just under 8kms. The final km is a bit more difficult – after the A100 gives way to Seestr, you need to keep an eye open for the significant road of Mullerstr – turn left and then 3rd right into Barfusstr with the Park on either side of you – the estate is N of the park. The main thing to remember is that Schillerpark is to the left of Seestr around 2kms after you join it. If you go too far the housing will have ceased and you will see a park on your left which is an extension of Schillerpark – in which case, work your way round by dead reckoning! We saw no signs in Schiller Park advertising its WHS status and certainly its housing was the least “notable” of the 3 estates we saw – which of course could indicate just how significant it was in setting the future standard for such estates! 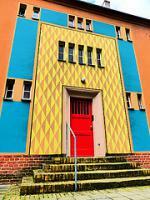 Unlike the other estates we saw it was the work of just one architect –Bruno Taut. Schillerpark to Weiße Stadt is incredibly easy. You reach it by continuing N along Barfusstr which becomes Aroser Allee where it bears left (you have no alternative). After 1 km you are there and you can’t miss the iconic blocks and, finally, the Bridge House overflying Aroser Allee (photo). There was signage here, primarily for the Seidlung as a whole, but we also found a tribute to one of the 3 architects involved - the Jewish architect Bruno Ahrends who was responsible for the main Aroser Allee “sweep”. In our eyes this estate had perhaps the most memorable visible impact but I wouldn’t suggest missing out either of the other 2 given the relative ease with which they could be fitted in to provide a range of experiences. I can imagine that for some people it is difficult to understand why these housing estates are a WHS. Certainly many visitors think: What is so special here? That looks just like my neighborhood. But as Ian Cade wrote in his review: this should be taken as evidence for the success and impact of this architecture. The housing estates are spread widely over Berlin, but I managed to visit them all in one day. But I had to start early in the morning and I spent much time in S-Bahn trains and stations. All estates have in common that they are very well maintained. Fortunately, the significance of the estates was already recognized in the 1960s and 70s and the buildings have been restored, in West Berlin as well as in the former GDR. The modern concept of social housing differed significantly from the traditional tenement blocks. The building blocks were open at the edges, there were many green areas and courtyards. The apartments had a high standard with bathrooms and private kitchens and many of them have balconies. The estates are different in their style and appearance. The Hufeisensiedlung Britz is probably the most exceptional of the six estates because of its central structure in form of a horseshoe. Falkenberg is a suburban estate with terraced houses and gardens, striking are the bright colors of the houses. The other estates are rather urban residential areas. 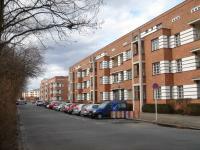 Schillerpark was the first modern urban estate in Berlin, with its red brick facade it reminds of the Amsterdam School of architecture (such as Het Schip). The Siedlung Carl Legien is closest to the city centre (near Prenzlauer Berg), but in my eyes it is the least rewarding estate. For me, the Weiße Stadt (photo) was the most interesting, maybe because the white cubistic elements reminded me of the Bauhaus style. Weiße Stadt and the nearby Siemensstadt (with the largest blocks) probably had the greatest influence on the architecture after WWII. However, in many of the later copies the principles of healthy and dignified housing are barely visible. I am interested in modern architecture, but I must admit that from a tourist point of view this WHS is not very attractive (the whole day I did not see any other people taking photos). But I really enjoyed strolling through these neighbourhoods, eating a 'Currywurst' at a snack stall and drinking a local beer at a typical Berlin pub. I like Berlin very much, mainly because of the 'mixture' of different architectural styles. Some recommendations for modern architecture: the government buildings around the Reichstag (and of course its glass dome), the Jewish Museum, the Holocaust memorial, and the quarter south of the Tiergarten with the Philharmonie (Scharoun), the New National Gallery (Mies van der Rohe), and many newly built embassies. Compared to the drab dilapidated post-war housing estates of Britain I found these housing estates in Berlin well maintained and architecturally inspired. In the course of a day, and using the U and S-bahns and the buses I reached all the locations listed. I found the pastel coloured terraced houses at Falkenburg the most attractive. I agree with Ian Cade's comment, that the estates can be a little underwhelming. I also feel that they wouldn't be my first choice of a place to live - not because of the quality of design, which is very high - but because they feel rather suburban and far from the centre of things. Of course this is probably missing the point; it's the terrible slum conditions that these estates sought to replace which need to be considered. It's perhaps ironic that so many younger/wealthier Berliners choose to live in the high density older apartments of Prenzlauerberg, and more increasingly in areas such as Kreuzberg, many of which were built as working class Mietskeserne accomodation. 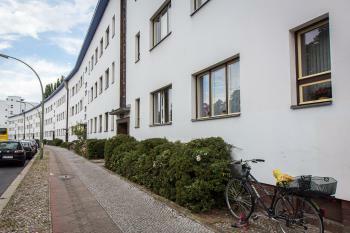 I first visited Berlin's housing estates in 2006,and was very pleased to find how many survived the war,and how well they had been maintained and restored by the enlightened Berlin authorities.I did not have an exhaustive list of sites at the time,and discovered my hotel was only yards from the Weisse Stadt,which I did not previously know. I have visited many famous modernist sites -Villa Savoye,Barcelona Pavilion,Quartiers Fruges,Weissenhofsiedlung,Karl Marx Hof,and so on,but the sheer number,scale and setting of the Berlin estates and their lesser-known ,later copies overwhelmed me. The suburbs of Berlin truly show what progressive architecture and landscaping can do to transform the urban environment -I think Berlin is more beautiful than Sienna or Rome,taken as a whole. After read Ian’s review, his comment is exactly what I think about Berlin’s new and the third world heritage site. I was not a fan of modernism, but after many good trips seeing lovely modern buildings such as Bauhaus in Weimar, Chilehaus in Hamburg, Rietveld Schorderhuis in Utrecht and Villa Savoye in Poissy, I developed to enjoy this kind of architecture, but Berlin was not my cup of tea. In 2005, I chose to see Schiller Park Housing Estate, the first apartment where sunlight, air and nature were the main elements for this utopia designed by Bruno Taut. However, the building I saw was exactly what I could see around my hometown neighborhood, red brick apartment with large windows and located next to the park. At first I even thought this was a wrong place and I really shocked to discover my map and information were correct and this typical building was the place I intended to visit. I spend only 10 minutes to walk around the place; there was nothing to see since all of them were private houses and the best thing I could do was strolling in nearby Schiller Park. As I mentioned I totally agreed with Ian’s review, these groups of housing estate are very important and undeniable for its effect throughout the world, but to be honest this maybe one of the least inspiring world heritage sites I’ve seen. I am still not too sure what to make of this inscription. On the one hand, I support it, these new housing estates were a key feature in redefining low-income/ social housing which has had a massive effect on peoples lives across the world. In counterbalance to this is the fact that they just weren’t that interesting when I paid them a visit. I know that this is a very subjective thing and preserving Heritage shouldn’t rely on just enjoyment, but the estate I visited just didn’t have the fission of visiting other sites with a similar background (Bauhaus, Mies’ Lake Shore Drive Apartments and the early Skyscrapers in Chicago). Admittedly I did only visit 1 and spied another from the S-Bahn, perhaps had I spent more time going to some of the other Estates I could give a more glowing recommendation but the time I spent in them did not encourage me to forego Berlin’s numerous other attractions. I managed to visit Wohnstadt Carl Legien on a cold Saturday morning in November 2007, needless to say I was the only ‘tourist’ here, and the residents were looking some what bemusingly at the guy taking endless photos of the blocks of flats. It was a reasonably rewarding visit for me, mostly as I have an interest in the architecture of this period. The blocks were well planned and spacious and there was a good use of colour (they have recently been restored). But on the whole they felt very familiar and nothing really that outstanding. I suppose though this is their real value, these were pioneers of so much that effects every day life for millions across the world. That they seem unique is a testament to their success. The Berlin into which they were built was one of the leading centres of liberal thought and activity, being at the centre of artistic and social progression. This was a great time of change in German and European history before the sudden change of direction that came in the 1930’s. The Berlin of today is once again a progressive and libertarian city with much to merit a visit. The area of Prenzlaur Berg where this particular estate can be found was a real delight to wander around and do some shopping and drinking. Probably the Britz estate would be the most rewarding to visit as this one has a slightly more distinctive character, however the estates are spread out across Berlin, none particularly close to a major attraction though. The earliest Gardenstadt Falkenburg is located next to the S-Bahn track one stop on from Schönefeld airport so you could in theory visit if you had a slight gap in connecting flights there. All in all these are pretty important testimonies not only to a change in living conditions for the less privileged but also a lasting testament to a progressive society which unfortunately was very short lived. They may not be the most exciting places to visit but their familiarity to many can be viewed as a sign of their success. 0.5: Walter Philipp Peterer Peter A.
Reinforced Concrete: From Nomination file "Taut managed to harmonise unusual expressionist details like the reinforced concrete pillars at the loggias whose tipped attachments almost reach the eaves with the cubic strictness of neues bauen" Re the bridge house by Otto Rudolf Salvisberg "The 40 m wide building of reinforced concrete rests on four rows of pillars with narrow cross-section and with its four upper storeys it looks as if it was weightlessly floating between the five-storied adjacent buildings"
Designed by Walter Gropius: He was one of a group of Architects working on Siemensstadt. Individual rows of houses within the overall plan were handed out to each architect to design and Gropius developed 2 in the eastern section of Siemensstadt at Jungfernheideweg. Extended from original TWHS: Originally only Hufeisensiedlung.